Preschool and nursery school fundraisers are very important. 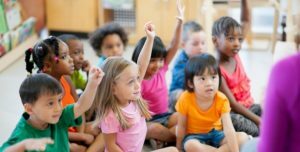 Preschool and nursery schools provide the opportunity for children to grow educationally, creatively, and socially at a young age. Fundraisers are necessary in order to keep tuition costs low for parents while providing a rich learning environment for children. Funds can be used for educational materials, classroom assistance, indoor and outdoor activities, toys, play structures, and much more. Preschools and Nursery schools usually have a lot going on with classrooms full of children. That’s why Giving Bean offers a coffee fundraiser that is easy to start, coordinate, and follow. Giving Bean has no startup costs and we also provide step-by-step instructions throughout the entire fundraising process so that your fundraiser is easy and effective. You will make 40% profit with our traditional paper fundraiser and 25% with our online fundraiser year-round. Giving Bean’s online fundraiser is great for out-of-town relatives or customers who loved the coffee and would like to reorder during the year. You can start a traditional or online fundraiser any time to fit your schedule or run multiple fundraisers a year whenever you would like to raise funds for your school!